Newmac Equipment Pty Ltd is proudly Australian owned. 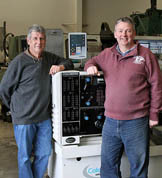 We are in the business of selling used machine tools & have been in business since 1983. Since that time has provided new and used metal working machines and accessories to industry and the education sector. We endeavor to stock a comprehensive range of used metal working machinery & accessories. Our dedicated staff are happy to assist with solutions to your manufacturing requirements. Newmac Equipment are also agents for Schaublin who are a Swiss manufacturer of quality high precision tooling. If we don’t have the metal working machines or tooling you are looking for, we can source an extensive range of equipment from our network of local and overseas suppliers. We welcome visitors our premises where our dedicated staff are happy to help.